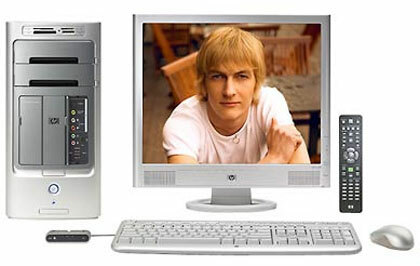 HP Pavilion M7570n desktop computer features dual-core Intel Pentium D Processor 915 with L2 Cache and 800MHz front side bus, 2048MB of PC-4200 DDR2 SDRAM, 7200RPM SATA hard drive, Intel Viv Technology, integrated TV tuner with personal video recorder (PVR), SupurMulti DVD optical drive with LightScribe technology, 9-in-1 media reader, built-in Wireless LAN and runs on Windows XP Media Center Edition plus Windows Vista Capable ready. Newsfactor Magazine (dead link) reviews HP Pavilion m7570n desktop PC and concludes with rating of 4.5 out of 5 that HP Pavilion m7570n has much to offer, even without an included monitor. The Intel dual-core Pentium chip, the large pool of memory and generous storage capacity, and the features for owners of HP cameras are a few compelling reasons to consider this desktop PC.